Mike takes care of Aom by feeding her food, medicine, and wiping her forehead, etc (You can tell that he is worried). We find out that he is also looking for a housekeeper. 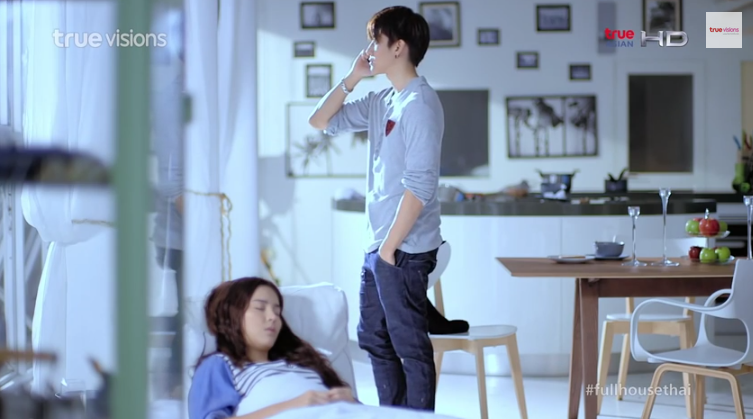 When he finally leaves for work, Aom – who is not sick anymore – quickly eats the food Mike cooked for her. She also proceeds to do some massive cleaning. Episode five starts with Jung Tae fighting his way into the inner quarters of a rival gang. He takes them out with practiced ease. He meets Il Myung Sam Chi Gi, a group of small time smugglers. He beats out the inner circle before punishing the leader, asking him where the kids are located. However, in a moment of distraction, the beaten inner circle get up and get the better of him. Luckily Poong Cha come sin to save the day before anymore damage is done. Jung Tae finds the hidden kids in a room. We flash to where grown up Ok Ryeon is bandaging up Jung Tae. Looks she still has a large crush on him, though I’m not sure if they are a couple yet. He meets up with Ggoo (who didn’t change appearance, Nasal voice and all) and appears to be working for him now. Ggoo says he saw Chung Ah who was wearing a butterfly headband, looks like Jung Tae is looking for her. I KNEW SHE DIDN’T DIE. In his anger, Jung Tae smashes his shot glass, shouting at Ggoo to tell him who kidnapped her. Plot: A huge 52 episode drama, New Tales of Gisaeng is as complicated as it is long. An intensely makjang piece, New Tales is an often overlooked gem. This drama focuses on the developing relationship between a young couple as well as the relationships of family and friends beside them. The story starts with the blossoming romance between Saran and DaMo, a young classical dancer from a poor family and the rich haughty heir to a company. While Saran keeps her dignity amongst her rich friends, DaMo lives looking down on women, a trait he had learned from his affection-less father. Intrigued by SaRan’s dignified demeanor, DaMo slowly opens up his heart to her and the two enter a clean relationship focused on honesty and trust. Though as all dramas will have it, SaRan encounters financial difficulty as well as learning that she was adopted. Coupled with a hurtful breakup with DaMo who lied because he was afraid of their status differences, SaRan makes drastic decision to enter a gisaeng house, Buyounggak. Episode Four starts with the mysterious Japanese guardian almost killing Jung Tae before Gaya stops him, saying she will kill both the boy and his father. Jung Tae nods before passing out, as if he is agreeing to let her kill him. Jung Tae’s father meanwhile is still searching for the guy who killed Gaya’s father. He meets the street elder who chastises Jung Tae’s father for messing things up and now having to leave. Gaya sits with her father’s ashes the next morning and finds a letter with her father’s marriage photo. The letter tells her to not trust the person who wears the other half of her amulet necklace. That person is the one who killed her mother. Mike and Aom arrive first. While Aom is focused on the menu, Guy and Min get there too. Imagine her surprise when she sees Guy (No way to run). The episode starts with Jung Tae jumping off the bridge just as the train speeds by. Everyone watches in horror as he disappears into the waters below. Both Ddol and Gaya are teary eyed when Jung Tae doesn’t resurface. Even Hong Sik thinks that he didn’t survive and was prepared to send his men to find the body. 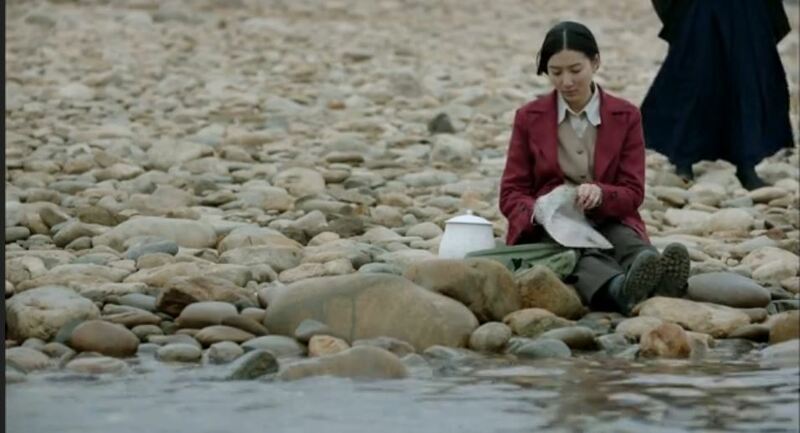 However, Jung Tae resurfaces a little ways down the river suddenly and swims towards the bank. Everyone is astounded and proud that he made the jump and survived. Jung Tae immediately asks if he can now “jump the train” with the Dobinori. Hong Sik ruffles his hair affectionately in approval. Jung Tae even gets admiration from the other members. Who wouldn’t after surviving that while still injured? Nasal Boy (Do Ggoo) meanwhile is recuperating with his gang hyungnims. His boss warms him to not mess with the Dobinori right now because Poong Cha is there. However, when they are falling apart, that is the time to attack. Jung Tae visits his mother’s grave and talks about missing his father when he was away. However, he confesses to his mother that he is scared to jump the train, but he has no other way now. Gaya finds him at this spot and scolds him that he should see his mother when he is happy, not grumpy. She confesses that she couldn’t breathe when he didn’t come back up for air at the river. She gives him back the scrape ointment. She is about to leave when he holds her wrist to have her stay and watch the sunset. Such cute banter between them! He walks her home and she asks him if she could visit his mother when she is fustrated because she doesn’t have one herself. Then she gives him a kiss on the cheek….which is seen by Ok Ryeon. Teary-eyed Ok Ryeon starts running away and Jung Tae tires to explain but, isn’t able to hold her back. Aom finally finds out that she is homeless and the end of the episode sees everyone finally back in Thailand! Aom is frantically looking for Guy’s business card in her purse. She finally finds it and call him, but is unable to reach him. She again tries to contact Oom but ends up leaving a voice mail telling her that the cost of a 3 night stay is 30,000 baht (~$900). Where can she find that kind of money??!!!! After roaming around the city, she has the idea of asking Mike for the money. She sneaks into his room when room service delivers his food. Mike sees her while he’s on the phone and is left speechless (I would seriously scream so loudly and call the cops). He continues his conversation and after he’s finally done, he tries to kick her out thinking that she’s a crazy fan girl in love with him (That sasaeng life). Aom interrupts him and lets him know that he is definitely not her type . She then proceeds by asking him for $$$ saying that they are all Thai and that they should help each other (shameless much). Mike bursts into laughter and then gets frantic. He goes into a rant and details all the crazy things fans asks him to do: dancing, taking his sunglasses off for pictures, randomly asking him to sing a song, etc. The conversation goes no where and he ends up picking her up and throwing her outside.